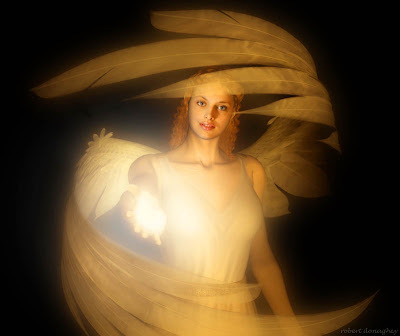 "... Angels' footsteps pass gently in our midst like falling snowflakes, silent and innumerable. Transparent before us, free of time and space they go unnoticed, but not untouched. Their nature is intertwined with our own, as created beings like ourselves. Immortal spirits, their singular purpose remains hidden, until ... at the Creator's wish they manifest themselves in all their glory. Understated glory perhaps, for to our masked perception all that is given to understand is a mere whisper, dream, or sign. Their secrecy beguiles us. Perhaps all this mystery is with good reason, for if we were to gaze upon an angel's true likeness, we may nearly die from the joy of their celestial light ..."